The LV170 optical liquid sensor accurately detects the presence of liquid in fiberglass double-wall tanks, containment sumps and double-wall pipes. Built-in electronic switching ensures dependability throughout its long service life. This reusable sensor easily fits small, interstitial spaces and senses liquid hydrocarbons or water. The unit is unaffected by hydrocarbon vapors, thereby greatly reducing the risk of false alarms. The LV170 sensor is easy to remove, clean and reinstall after an alarm condition is triggered, or for maintenance. 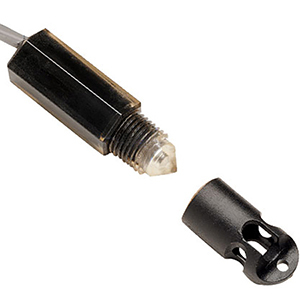 The LV170 electro-optical sensor contains an infrared LED and a light receiver. Continuous light from the LED is directed into a prism which forms the tip of the sensor. With no liquid present, light from the LED is reflected within the prism to the receiver. When rising liquid immerses the prism, the light is refracted out into the liquid, leaving little or no light to reach the receiver. Sensing this change, the receiver actuates electronic switching within the unit to operate an external alarm or control circuit. 참고: Comes complete with 25 ft. three (3) conductor PVC jacketed cable and operator’s manual.